Trump got a wrist slap by the Senate on troop withdrawals. That's a green light. WASHINGTON — It's easy to read the Senate's vote Thursday against a "precipitous withdrawal" from either Syria or Afghanistan as a major, bipartisan whack at President Donald Trump, who has announced his intent to bring American troops home from both nations as quickly as possible. After all, the amendment was sponsored by Trump's floor general in the Senate, Majority Leader Mitch McConnell, R-Ky., and the vote Thursday — on whether to end debate and move to a final vote — secured support from 68 senators, including the top Democrat on the Foreign Affairs Committee, Sen. Bob Menendez, D-N.J. Even Trump seemed to take it as a reprimand. But it might be just the kind of slap on the wrist that gives Trump the go-ahead — both politically and in policy terms — to move forward. Critics of the president's calls to withdraw troops from Syria and Afghanistan worry that, in the absence of American forces, bad actors will be empowered. That could lead to greater instability in already volatile regions and an increased threat of terrorism, they argue. But McConnell didn't move to block funding for a withdrawal, nor did he try to rewrite the war authorizations under which U.S. troops operate in Afghanistan and Syria. By the time the Senate votes Monday on the substance of the amendment, it will have spoken on Trump's plan without binding his hands. McConnell himself called it "just an opportunity for senators to go on the record about what our country should be doing in Syria and Afghanistan." More important, McConnell's vote has shown that Democratic presidential candidates agree with the president's position — or, at least, that they're not willing to challenge him on it. The roster of 23 "no" votes on Thursday was littered with the names of Democrats who have launched campaigns or are weighing whether to run in 2020, including Sens. Kamala Harris, D-Calif., Elizabeth Warren, D-Mass., Cory Booker, D-N.J., Kirsten Gillibrand, D-N.Y., Bernie Sanders, I-Vt., Amy Klobuchar, D-Minn. and Jeff Merkley, D-Ore.
"The president is standing up to traditional Republican orthodoxy on foreign policy after years of having a forward-leaning, military-pronounced worldview," said one veteran Republican operative. "The president is continuing to make good on his public statements of withdrawing kinetically from the theater of war. And then, with that, the fact that all of the Democrats running for president [voted against McConnell and with Trump], I think that illustrates that this is the will of the American people after how many years of war fatigue." It's hard to see how that hurts Trump politically. But voting the other way would have been perilous for many of the Democratic candidates. Several of them have been vocal about their desire to end what they call "forever wars." Warren, for example, called for a withdrawal from Afghanistan in November. "We can — and we must — continue to be vigilant about the threat of terrorism, whether from Afghanistan or anywhere else. But rather than fighting in an Afghan civil war, let's help them reach a realistic peace settlement that halts the violence and protects our security," she said. "It's time to bring our troops home from Afghanistan — starting now." There are differing opinions among Democrats about the policy — even if they mostly agree that Trump should not have announced a withdrawal from Syria on Twitter. Kelly Magsamen, vice president for national security and international policy at the liberal think tank Center for American Progress, said Democratic lawmakers were frustrated in the last Congress over what they saw as a lack of GOP oversight of the Trump administration on the wars, the president's North Korea strategy and his threats to international alliances. "The McConnell amendment should be viewed through that lens — a limp effort to check Trump," Magsamen said. "What we need is a real congressional effort to examine our strategy in places like Afghanistan and Syria and to come up with a responsible way to end these costly wars." 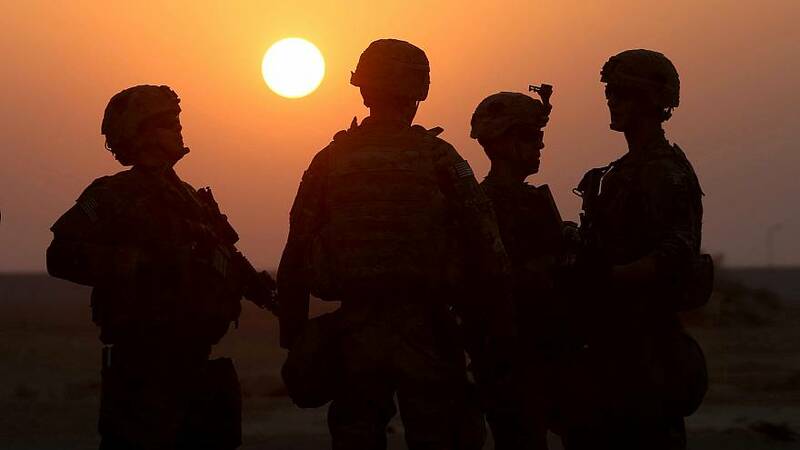 South Bend, Ind., Mayor Pete Buttigieg, one of two veterans currently running for the Democratic nomination, said when he announced his candidacy last month that the U.S. has to "get out of Afghanistan." But he also said the predicate for that must be "a negotiated solution that establishes some level of regional security" so that the U.S. doesn't have to return to the country to answer another terrorist attack. "Staying there infinitely with no plans is not going to work. Neither is leaving with no plans." For Trump — whether the motivation is policy, politics or both — the calculus seems much simpler: get out now. By holding Senate votes on the topic, McConnell found a way to mostly unify Republicans — only three voted against him — split Democrats, refrain from limiting Trump's policy options and highlight the fact that Trump's rivals for the presidency are aligned with him on the overall question of withdrawing troops. If anything, Trump should be thanking McConnell for his service.